This property specifies the indentation of the first line of text in a block container. More precisely, it specifies the indentation of the first box that flows into the block's first line box. The box is indented with respect to the left (or right, for right-to-left layout) edge of the line box. User agents must render this indentation as blank space. 'Text-indent' only affects a line if it is the first formatted line of an element. For example, the first line of an anonymous block box is only affected if it is the first child of its parent element. Note: Since the 'text-indent' property inherits, when specified on a block element, it will affect descendant inline-block elements. For this reason, it is often wise to specify 'text-indent: 0' on elements that are specified 'display:inline-block'. If an element has a computed value for 'white-space' of 'pre' or 'pre-wrap', then neither the glyphs of that element's text content nor its white space may be altered for the purpose of justification. Note: CSS may add a way to justify text with 'white-space: pre-wrap' in the future. This property describes decorations that are added to the text of an element using the element's color. When specified on or propagated to an inline element, it affects all the boxes generated by that element, and is further propagated to any in-flow block-level boxes that split the inline (see section 9.2.1.1). But, in CSS 2.2, it is undefined whether the decoration propagates into block-level tables. For block containers that establish an inline formatting context, the decorations are propagated to an anonymous inline element that wraps all the in-flow inline-level children of the block container. For all other elements it is propagated to any in-flow children. Note that text decorations are not propagated to floating and absolutely positioned descendants, nor to the contents of atomic inline-level descendants such as inline blocks and inline tables. Underlines, overlines, and line-throughs are applied only to text (including white space, letter spacing, and word spacing): margins, borders, and padding are skipped. 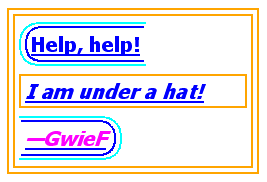 User agents must not render these text decorations on content that is not text. For example, images and inline blocks must not be underlined. This is expected to be specified in level 3 of CSS. Word spacing algorithms are user agent-dependent. Word spacing is also influenced by justification (see the 'text-align' property). Word spacing affects each space (U+0020) and non-breaking space (U+00A0), left in the text after the white space processing rules have been applied. The effect of the property on other word-separator characters is undefined. However general punctuation, characters with zero advance width (such as the zero with space U+200B) and fixed-width spaces (such as U+3000 and U+2000 through U+200A) are not affected. The actual transformation in each case is written language dependent. See BCP 47 ([BCP47]) for ways to find the language of an element. Newlines in the source can be represented by a carriage return (U+000D), a linefeed (U+000A) or both (U+000D U+000A) or by some other mechanism that identifies the beginning and end of document segments, such as the SGML RECORD-START and RECORD-END tokens. The CSS 'white-space' processing model assumes all newlines have been normalized to line feeds. UAs that recognize other newline representations must apply the white space processing rules as if this normalization has taken place. If no newline rules are specified for the document language, each carriage return (U+000D) and CRLF sequence (U+000D U+000A) in the document text is treated as single line feed character. This default normalization rule also applies to generated content. UAs must recognize line feeds (U+000A) as newline characters. UAs may additionally treat other forced break characters as newline characters per UAX14. The following examples show what white space behavior is expected from the PRE and P elements and the "nowrap" attribute in HTML. If 'white-space' is set to 'normal' or 'nowrap', linefeed characters are transformed for rendering purpose into one of the following characters: a space character, a zero width space character (U+200B), or no character (i.e., not rendered), according to UA-specific algorithms based on the content script. Then, the block container's inlines are laid out. Inlines are laid out, taking bidi reordering into account, and wrapping as specified by the 'white-space' property. When wrapping, line breaking opportunities are determined based on the text prior to the white space collapsing steps above. Floated and absolutely-positioned elements do not introduce a line breaking opportunity. Note. CSS 2.2 does not fully define where line breaking opportunities occur. Combining characters should be treated as part of the character with which they are supposed to combine. For example, :first-letter styles the entire glyph if you have content like "o<span>&#x308;</span>"; it does not just match the base character.